Consider this post my own little TasteSpotting. I've got several dishes- from breakfast to dinner and dessert-that I have been wanting to post about for a while, but because of time constraints they will never boast their own individual posts. So here they are in picture form with a few recipes to boot. Perhaps you can glean a little inspiration for your lunch today, or maybe you'll just scroll through and say "Had it. Had it. Made it. Over it." Whatever you choose to do is fine with me, what do I care? Hey, I'm off to do some cooking over an open fire, have tickle fights in the family tent, build some sand castles and enjoy getting back to nature without a battery operated toy for miles around. I haven't showcased many berry recipes yet this summer, but that doesn't mean we haven't been scarfing them down by the bucket fulls. We've enjoyed them many ways like Mango-Blueberry Lassies and Chocolate-Raspberry Ice Cream Sandwiches (recipe coming soon!) I loved this breakfast dish because it is made up the night before and all you have to do in the morning is bake it off and whip some cream. Don't leave your mixer beating the cream and go check your email, like I did, or your whipped cream will more resemble butter than a creamy topping. Tisk-Tisk. The night before: Grease two 8 oz ramekins. Line bottom half with bread cubes. Cover with blueberries and cream cheese cubes and top with remaining bread. Mix eggs, milk and syrup together and pour over bread. Cover and let soak overnight in refrigerator. In the morning: Preheat oven to 350F. (Make your coffee and wake yourself up) Bake for 25-30 minutes or until puffy and golden. Remove from ramekins and serve with your topping of choice and plenty more of that coffee. If you are lucky enough to get to one of Montreal's fine bagel shops, those bagels are all you really need to enjoy your smoked salmon and cream cheese, but all the other fixings are pretty sweet to spoil yourself and your surprise lunch guests with, too. I know, I know, I couldn't let these beauties from my own garden go to waste, so I overcame my fear of ingesting bugs and slugs (happened to me IN a restaurant), gave the blossoms a good clean and was so happy I did. They were amazing, as was the sherry mayo I made to go with them. Heavenly. Everyone's favorite snack, these ones are my Aunt Jenny's specialty: crusty rounds of baguette, oven-roasted, über-ripe sliced tomatoes, sprinkled with fresh herbs and drizzled with olive oil and salt. Serve warm and make lots. For the bacon-lovers in your family. Toss asparagus in olive oil and season, then wrap with panchetta. Group into rows of about 5 spears each and run a skewer through them to bunch together for easier grilling. Grill over a low flame and serve warm. 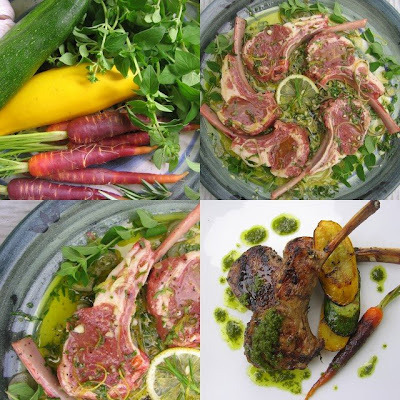 Thanks to copious amounts of oregano in my garden, Salmoriglio is a fresh herb sauce I whip up all the time to accompany grilled meats, especially lamb. These chops benefited from an overnight marinade of olive oil, tons of oregano, a touch of rosemary, some lemon zest and plenty of black pepper. The vegetables are picked from my little kitchen garden. In a mortar and pestle pound the herb leaves and salt until completely crushed. Add the lemon juice. Pour the oil slowly into the mixture. Add a little pepper. Drizzle over grilled meats such as lamb or beef. Variation: Marjoram, thyme or lemon-thyme can be substituted for oregano. I'm enjoying immensely the crop of garlic I planted last fall. If you've never tried growing garlic, you are missing out on one of the easiest and rewarding gardening experiences to be had. I forget exactly which month I planted the little cloves (guessing late October) but they were the first thing to poke up out of the ground this spring and now there are hardly any left because I can't stop pulling them up and adding them to everything! You can see the tight, juicy bulb sliced in half in the photo above. It's hard to buy garlic this fresh. OK, this potato dish really deserves it's own post, but lucky you are getting it now. 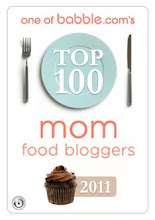 Seriously, don't you feel like this post is a virtual Christmas stocking of great recipe ideas?? And there's still more to come! 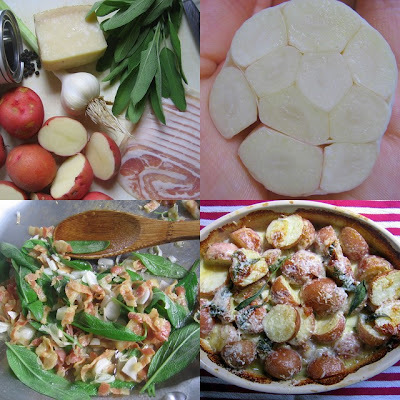 Every once in a while I come across a potato recipe that stops me in my tracks--the last one being Tartiflette--and this dish is a favorite in my repertoire. I've been making it for ages and meaning to share it...but you know how it goes, it usually gets gobbled up before I can snap a photo. Oh, and would you believe it? This recipe is also from the River Cafe Cookbook. If you don't own it already, put it on your Christmas List. The garlic and fresh sage is from my garden, the potatoes are not as I am patiently waiting for the plants to flower before I drop on all fours and furrow into the earth to collect my bounty. The recipe suggests Roseval or similar yellow waxy potatoes, but I have made it with pretty much every kind of potato. Of course, new potatoes are ideal. Preheat oven to 375F. Heat the oil in a frying pan and fry the pancetta over a medium heat. Stir in the garlic, add the sage, cook for a minute and remove from heat. Slice each potato lengthwise (or in 1/2 inch wedges if you are using large potatoes). Place in a large bowl and add the pancetta and oil mixture and the cream. Season with salt and pepper and toss together. Put in a baking dish, making sure that the potato, pancetta and sage are evenly distributed, cover with foil and cook in the oven for 40 minutes. About 20 minutes before the end of cooking, remove the foil so that the surface of the potatoes become brown. Add a little Parmesan 5 minutes before the end. Enjoy! We haven't been eating a lot of sweets around here (shocking, I know) but I am showcasing two of my favorite summer desserts from previous posts. Picking a favorite recipe is like asking which of your children you love more, but these two recipes sprang to mind when I was thinking about fresh summer flavors in desserts. The best part is that they are both minimal effort as well as gorgeous! So the first dessert is this pretty panacotta with strawberry coulis and fresh strawberries. In the original post I didn't gush overly about my love of panacotta, but it's a love affair that hasn't wavered in many, many years. Originally created by the pastry chefs at Restaurant Toque! many years ago, this cute cone-shaped panacotta was my dinner party dessert of choice for some time. The tops bow and jiggle when you bring them to the table in a comical and inviting way. So cute! Of course any fresh berries would be lovely with this dish and I remember a cherry compote I once made that was a hit, too. It is nice to have options and here is the second dessert that sums up the lazy days of summer. I created this peach galette to round out a fabulous dessert table for a party my siblings and I threw for my parents last summer. (Read all about it, see the sweet table and get the galette recipe) This rustic dessert was up against some big names in dessert show-biz like Dark Chocolate and Wild Strawberry Cupcakes and Citrus and Cointreau Cheesecake, but at the end of the evening was declared the favorite by many. Of course, the accompanying whipped cream was in perfect peaks, so that helped! So there you have it. Now go get cooking and if your tummy isn't rumbling yet, you need help! Labels: Asparagus, Blueberries, Bon Matin, Comfort Food, How does your garden grow?, What's For Dinner? Six weeks ago, I invited you to participate in a Jam, Jelly and Preserve swap, scheduled to happen late this fall. I promised to keep you abreast of the details and so here is the latest news, hot off the press! 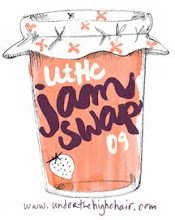 If this is the first you have heard of Under the High Chair's Jam Swap, read more about it in the official invitation! OK, I've been meaning to post this update for a while now and encourage everyone in their canning endevours, but how could I light a fire under those of you who are still undecided when I myself had not yet gotten started on preserving summer? Fortunately this week I managed to make a batch of fresh local Raspberry-Vanilla Bean Jam, so now I can at least say that I have gotten a jump on my home canning! I still have many little jars to fill ( love these ones from Canadian Tire) and am waiting for inspiration to hit me for the next batch. So, for the update!! I was thrilled with the response I received back in June to the invitation and heartily thank those of you who emailed and left comments. A few people have been asking if the swap is still happening and let me reassure you, we are in like Flynn! Good news, we have a date set! The swap will be on Sunday, November 9 sometime in the afternoon. It's not too close to Christmas, but late enough to turn those October apples into butter and sauce. I will booking a location once I have a better idea of how many people will be attending. Just a reminder, if you are interested in participating, just leave a comment or send me an email and let me know. If you have an idea what you are bringing, that would be good information to have as well. Again, read the initial invitation for suggestions and requirements on how to participate. Also, please feel free to email at any time if you have any questions or suggestions to help make this event a success! It is great to see people getting excited about this swap!! In addition to a group of about twenty local participants (so far), we will be welcoming readers who are making the trip from Quebec City and Ottawa. Talk about dedication! I have received a few emails detailing what people are bringing and the line-up is tantalizing; I'm particularly anticipating some Okanagan Cherry Jam from a reader who was recently in British Columbia and was thinking ahead for the swap. Also something to look forward to is the participation of famed Montreal chef and spice merchant, Philippe de Vienne (and several of his staff) who I've talked about on many occasions like here and here. I'm sure he'll come up with something that will leave us all shaking our heads in wonder. One a closing note, I have had a few requests from individuals for a tutorial of sorts on jam making and the safety issues of preserving, but I am nowhere near qualified to give any such thing. I have never claimed to be an expert in this area and shudder at the thought of leading people astray, or worse, causing anyone harm by coaching a fatal batch of spoiled beans. Home canning is still a huge learning process for me. Personally, I have never experienced any problems, either with products I have made or received as gifts, but I know it is a concern for some people. If you are lucky enough to have a family friend or grandmother who is skilled in this area, consider asking them to show you a thing or two and walk you through the process. I won't be giving the recipe for the Raspberry-Vanilla Jam because on closer inspection it is a little too runny to be classified as 'jam'. It is more like a coulis or thick syrup and I'll have to figure out what happened. And here I was so happy that the vanilla seeds didn't sink and the raspberry seeds didn't rise! Oh well. It tastes heavenly and I am thinking how fabulous it would be over vanilla ice cream or a stack of waffles. OK, I know what I am having for breakfast! Happy canning to each and every one. I've had enough cakes for a while, thank you very much. Enough butter, enough sugar, enough icing. Please stop already with the flour sifting and the spatula licking--oops, did I just say that? I would never lick a spatula! Seriously, though, after making this cake last weekend, I am ready for a change. I need to sweat some onions or grill some meat, and spend a few hours making a minestrone with perfect vegetable cuts. Nothing went wrong with the cake and I was happy with how it turned out, but I was SO stressed out about it, I was hardly able to enjoy the process. Really, not until it was sliced, served and folks wiped the crumbs off of their mouths with their napkins did I really sit back with a sigh. OK, who am I kidding, it was more like make a beeline for the bar and down a rum and Coke. Now I've made my fair share of cakes and I'm quite comfortable in that area, so you are probably wondering 'why all the sweat? ', but it was the areas out of my control that had my knees knocking last Saturday. Things like the ultra high humidity and thundershowers. We must be on one of the worse power grids in Quebec, because we seem to lose electricity at the slightest gust of wind. It crossed my mind more than once that I could very well be stuck with three tiers of iced wedding cake sitting in a dark, dead fridge at any point in time. Seriously, it's happened before. Somehow, though, we managed to avert disaster at every turn and deliver a cake that the bride loved. It survived the van ride from my place to the reception hall, thanks to Danny's mad driving skills, and we even made a quick pit-stop for a poutine-to-go for our growling stomachs. I needed something salty to counter balance all the icing and cake in my system! I couldn't stop eating all the scraps and trim during the cake assembly process. There were probably a few nights where I just sat down to a big bowl of icing and a glass of milk for a late supper. So this was my second attempt at a tiered cake with rolled fondant and I'd say it came out just OK. However, I think I am going to enjoy playing around with fondant in the future. It's so easy to work with, like grown-up play dough. Each tier of wedding cake had a layer of chocolate cake and a layer of vanilla buttermilk cake. (A photo of how this looks and both recipes can be found here.) Everything was then coated in a simple buttercream and covered in rolled fondant. For the decorations, the bride had a few requests. The bridesmaids wore pink that we matched the ribbon on the cake to and the white mini-gebera and lisianthus on the cake were echoed from the brides bouquet. Lastly, the antique bride and groom topper were passed down from the brides' mother, who had used them on her wedding cake, some 35 years or so ago. I though that was sweet. So huge congrats to the happy couple, A & J, and thanks so much for letting me be a part of your wedding day! For now, though, it's time for a little baking break. Danny is on summer holidays and we're looking forward to some sweet family time! A trip to the zoo is planned, as is a three day camping trip. I think I know what I am getting myself into-tenting with two babies-but if anyone has any tips to pass along, they would be much appreciated. And no I don't mean "get a hotel", either. I feel the need to keep apologizing for my sub-par photos, but probably should come to terms with the fact that this is how it's going to be for a little while. Baby Mateo is now a laughing 16 lb, 4 month-old who Must. Be. Held. and so I usually end up shooting with him on one hip. Also Noah, who is almost 3 now, and thinks it's great fun to traverse the kitchen at top speed and slam into my knees right when I have the perfect shot. YOU try holding a camera steady! Sigh. So for the last time, sorry for the lack of inspiring photographs. Check out the super talented Aran's photography on Cannelle et Vanille if you really want to see some gorgeous stuff. The babies keep on coming and so do the cakes! We love babies around here and in the last few weeks were thrilled to welcome Angelique, Jesse and Owen to our extended family. I wasn't kidding when I said that three of my sisters-in-law were pregnant! Congratulations to the proud parents and best wishes for the new chapters in your lives ahead. This cake was for a friend of mine and first-time mama, Valerie, who is due in just a few weeks, but I have to admit, it was a trial run for the wedding cake I am doing this weekend. I wanted to see if I could cover an 11-inch cake with rolled fondant and actually succeed, not like this disaster! It came out OK and was lots of fun to do, even if it involved waking up at 6:30 am to decorate so as to be ready for a 9:30 AM brunch baby shower. Who does that?? So quickly clockwise from top left: rolling out the fondant...to find I have waaaaay too much. Oh well, better than to little! Then there is the trimmed and smoothed cake with the humidity starting to make it glisten; a closeup of poke-a-dots. I dyed the fondant a pale blue (yes, it's a boy! ), wrapped the bottom in satin ribbon, and cut a pregnant lady out of fondant for the top. You can find the template here for the silhouette, designed by the super creative Melody of My Sweet and Saucy. I keep stealing it, but she's so pretty, how can I not? I was unsure of how else to decorate the cake, as I was still a little bleary eyed, but after my morning coffee kicked in, and with time ticking on--oh look, I haven't done my hair yet, either-- I decided poke-a-dots would be cute and easy. So I rolled out more fondant and used the small end of an antique piping tip (size 12) to cut perfect circles. Again, improvisation is key at all times! 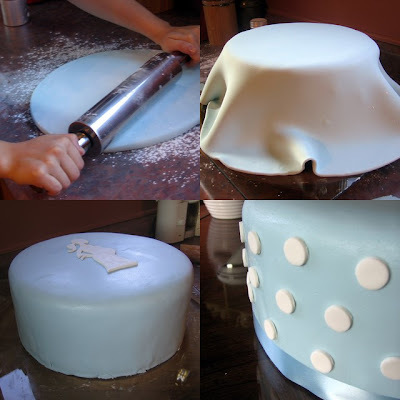 By this time the fondant was sweating ever so slightly, and all that was required to fix the poke-a-dots to the side of the cake was a gentle push of the thumb. I used two really reliable recipes for this cake: a buttermilk cake for the top and chocolate for the bottom; that way everyone gets a sliver of each so you never have to decide what flavor you want. Who can make these kinds of decisions before noon anyway? Email me if you have any questions about quantities. 1. Preheat the oven to 325. Sift together flour, baking powder and baking soda. Add the salt after sifting and set aside. Measure out the buttermilk and set aside. 2. Cream the butter and the sugar using an electric mixer, until the mixture is pale and fluffy. Add the eggs one at a time, letting the eggs beat for 1 minute in between additions. Scrape down the bowl in between additions. 3. Add the dry ingredients alternately with the wet ingredients. Start by adding one third of the flour mixture. Mix just to incorporate. Add half of the buttermilk. Add another one third of the flour mixture. Mix to incorporate. Add the last half of buttermilk, followed by the last third of flour. 4. Pour into two buttered 7-inch round cake pans or one 9x13 pan. Bake about 15 minutes or until a cake tester comes out clean. Preheat oven to 350 degrees. Butter two round 9-inch cake pans or one 9x13 pan; set aside. In a large mixing bowl, sift together cocoa, flour, sugar, baking soda, baking powder, and salt. Add the eggs, warm water, buttermilk, oil, and vanilla; mix batter until smooth, about 3 minutes. Scrape down the sides and bottom of bowl to ensure batter is well mixed. Divide batter evenly among pans. (If I have any extra batter I like to make a few mini cupcakes.) Bake until tops spring back when touched, about 20 minutes, rotating pan once if needed. Is that a mini head of broccoli I see peeking through the leaves? The garden status is as follows: shamelessly overgrown and full of weeds. The weather continues to be quite hot with plenty intense rain bouts, so the plants are managing to thrive despite my sheer neglect. Still, something must be done soon! I need to stop baking cakes and get my hands dirty out there. OK, one last wedding cake this weekend and I am done for a while. Promise. 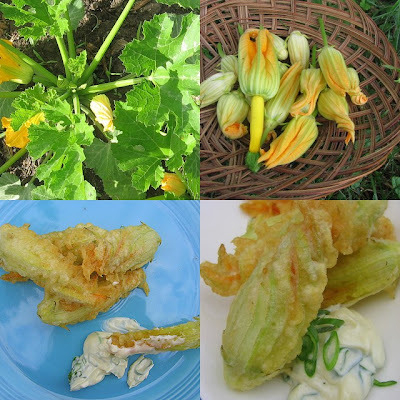 We're enjoying these courgettes sliced very thinly on pizzas with wild boar sausage. Is that corn getting taler than I am?? Not hard to do. As Noah-the-backseat-driver always chants "Red means stop and green means go" but not in the case of these sweet cherry tomatoes. Full speed ahead to pick those red ones! Young onions. SO GOOD thinly sliced on a burger. I can't believe this is my first time to grow onions. They are such fun! First peppers starting to form. A few baby carrots; the rest are in desperate need of thinning. The purple color is just starting to show. Labels: How does your garden grow? My parents returned to British Columbia this week and I returned to blogging catch-up, an overgrown garden, a neglected house, and piles of laundry! We are recovering from the non-stop action that ensued while they were here, not to mention a nasty cold for Yours Truly, and trying to get back to a normal routine, whatever that is! It is always fun to play tourist in your own town and we had a great time soaking up the culture of the city together: visiting art galleries, catching a few shows at the Jazz festival, window shopping, and of course, dining out. 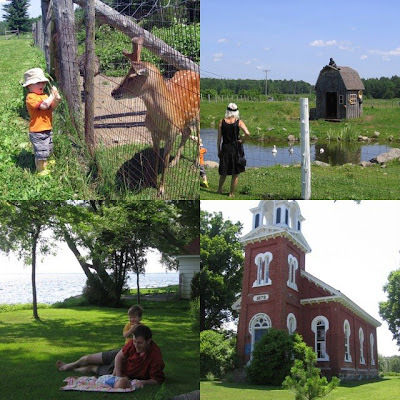 Quebec's beautiful countryside didn't go unnoticed either as we managed to spend three days touring rural Quebec, visiting wineries, local farms, quaint towns and relaxing by lakes. Such fun! But mostly during their visit we ate! We feasted on grilled lamb, fresh seafood, BBQ-ed steaks and a cheese fondue and plenty other delicious dishes as I was determined to put a few pounds on my svelte parents. As usual I was too busy hosting, cooking and mothering to take any photos of our dining enjoyment, let alone half a brain to remember what ingredients I put together, but there was one exception that managed to get partially captured and that was a Sunday afternoon garden party where we stuffed ourselves with pulled pork sandwiches. Inspired by the cover of Gourmet magazine's June issue,I thought pulled pork would be a great way to go for a hungry group of twenty-five or so close friends and family. This was a very homey menu, perfect for a backyard party, with plenty of comfort food favorites like potato salad and brownies. Guests helped themselves to a table full of food and made their own sandwiches, while paper plates made for easy clean-up. I was determined to keep the menu simple, and almost everything was made the day before. I had to talk myself out of making the recipe for buns in Gourmet and saved time and energy by buying several dozen. I also had a few people bring brownies, so we would have an assortment without me having to bake all afternoon. That helped a lot and so a big "thank you" to those who made brownies! It was a sweltering hot day, but we kept cool in the shade with the help of some homemade beverages. I made my iced tea with Earl Grey, then added thin slices of lemon and lots of ice just before serving. The day before the party Danny squeezed oodles of lime juice to which I added simple syrup. I stored that concentrated mixture in my fridge and then added cold water, ice and raspberries when I served it. The berries turned it a pretty pink color. The pulled-pork sandwiches were the highlight of the meal, though: crusty buns, crunchy coleslaw, tender sweet and sour pork. I had tried a few recipes previously and found this one from Martha Stewart to be best suited to my busy schedule. While the Gourmet recipe takes over 8 hours on a charcoal kettle grill with plenty of basting and babysitting, this recipe turned my 12 pounds of pork shoulder into fork-tender shreds in about three hours in my oven. Perfect! This recipe, together with my simple coleslaw and some buns, you are set to entertain this summer! Preheat oven to 350 degrees, with racks in lower and upper positions. In a small bowl, combine sugar, cayenne, 1 tablespoon salt, and 1 teaspoon pepper. Place pork in a 5-quart Dutch oven or large heavy-bottomed pot; rub with spice mixture. In a medium bowl, combine vinegar, garlic, and 1 cup water; pour over pork. Cover pot, and place in oven on lower rack. Bake until pork is very tender and separates easily when pulled with a fork, 2 to 2 1/2 hours. Transfer pork to a work surface, reserving pan juices. With two forks, shred meat. Transfer to a large bowl, and toss with pan juices to moisten (you may not need all the juices). Pile pork on rolls, and top with barbecue sauce, if desired. Toss cabbage, carrots and radishes with salt and pepper in a large bowl. In another bowl combine mayo, vinegar and sugar. Toss mixture with slaw until well combined. Cover and chill for at least one hour. May be made up to one day ahead of time and kept chilled. Labels: Sandwiches, What's For Dinner? A large box of chocolate arrived for me recently. It was just in time, too, as I had cleaned the cupboards bare of anything chocolate and was starting to sneak Noah's Smartie stash that we keep for potty training. No chocolate in the house means hard times around here. I always keep some on hand for baking and snacking. Where did all this chocolate come from? Did I order it? Win a draw somewhere? Nope, it was from the company Dove and completely free, hence the 'dream come true' part! Sweet! I was so excited to be recently contacted by the Montreal advertising company, Matchstick, and asked if I would be interested in receiving a Dove Chocolate 'Pleasure Pack', no strings attached. All I had to do was enjoy it! Duh, yeah! Matchstick is a member of WOMMA (Word of Mouth Marketing Association) which is the newest force in the wold of marketing and starting to catch on all over. It's a brilliant idea, really, I mean if we find a product that we love, we can't stop talking about it, right? I didn't have a very hard time convincing them I was a chocoholic and an ideal candidate for their program! "How soon can I get the chocolate?" I asked "Because I am expecting 16 girls here for a party this weekend and the theme is chocolate". Well, it didn't make it here in time, but that's OK as I would have had a hard time sharing it! So, yea, I've been on a permanent sugar high and chocolate-induced pleasure coma since it all arrived. I'm a fan of milk chocolate for snacking and prefer dark chocolate for baking and I was lacking nothing with this pleasure pack. Also included was the smartly named 'Dusk' chocolate, which is what they call milk chocolate with a hint of dark. It's great and perfect if you can't decide between dark or milk. So all the little 'purse packs' went pretty fast (lucky receivers, you know who you are!) but I stashed the bars away for some baking and that's how these brownies came to be. I figured they would be a pretty good test of the chocolate and was impressed at how they turned out. I used a fabulous recipe from Tartelette for Katherine Hepburn's Brownies, one of those outstanding recipes of Helen's that has been bookmarked for ages but I have never gotten around to make. If you haven't checked out her blog yet, get cracking! Not only is she a sweetie, but she just signed a book deal and will be putting out a cookbook soon! Lucky us! I seldom make brownies; I guess I'm more of a cookie girl, but that is all about to change as these were amazing! They were plenty moist, but not so gooey to require several napkins. I didn't count how many of these I ate right out of the pan, but it was a lot and so let me warn you, they are highly addictive. I under baked mine slightly so as to have more of a fudgy brownie, oh and I threw in some walnuts for fun. In a heavy saucepan, melt the chocolate with the butter over low heat, stirring until completely melted. Remove from the heat and stir in the sugar, coffee, cocoa powder and cinnamon . Add the eggs and vanilla and whisk well. Stir in the flour, walnuts and salt and mix well. Spoon the batter into the prepared pan and bake for 40 minutes.